Burnley Ladies’ march towards the upper regions of the North West Regional Premier League suffered a setback when they were held to a 2-2 draw at bottom club Northwich Vixens. After conceding an early goal, the lady Clarets discovered their rhythm, and they created several chances – a cross from Justine Wallace was struck on the volley by midfielder Em Forrest, but the ball flew narrowly wide, before a superb cross to the far post by Natalie Bell found the head of Sarah Greenhalgh, but the striker’s effort was off target. Jane Sexton latched onto a pinpoint cross-field ball from Greenhalgh but her shot faded the wrong side of the upright. Then a 20-yard free kick from Wallace was spilled by the keeper, but the Clarets could not force the ball in. Despite their dominance, Burnley could not find an equaliser before the break. And the situation could have worsened on the stroke of half-time but keeper Taylor Gregson, diving at the feet of a striker. 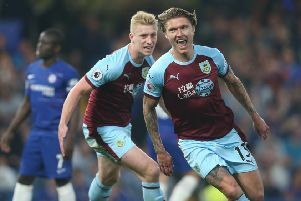 Burnley continued in the ascendancy after the interval, and in the 53rd minute, Greenhalgh side-footed Wallace’s corner into the top corner. Two minutes later, Wallace’s 20-yard strike dipped over the bar. But the Clarets were not to be denied, a powerful drive from Greenhalgh striking the underside of the bar and Becky Hayton fired home the rebound from close range. But Burnley lost their way in the closing stages, and in the 80th minute a defensive mix up gifted Northwich an equaliser. On Sunday, the lady Clarets entertain Preston North End at the Barden Sports Club, kick-off 2 p.m.